By New York Times Paris Bureau Collection. Even through the thick walls and the blackout curtains, the sounds of the bombing raid filled the fire station. Sirens blaring. Bombs exploding. The fire of anti-aircraft guns. The roar of engines from the planes overhead. Albert Wright sat on the side of the fire engine, ready for action. He had rushed here as soon as the raid started, leaving behind the flat above his tailoring business. He was surprised that they’d been waiting here so long. The phone rang. Macaulay snatched up the receiver, listened for a few seconds, then set it back in the cradle. “First of the night,” he said grimly. A minute later, they were out the doors and racing through London’s dark and empty streets. Somewhere overhead, the RAF were fighting the Nazis. Down here, Albert had his own battle to face. As they reached the street, it was obvious what had happened. The remnants of incendiary bombs still smouldered in the road, but the fire at the end of the terrace lit up the night. Smoke billowed from the blazing house. Flames darted from the windows. They leapt from the wagon, connected the hoses, and directed them onto the blaze. Neighbours watched, some fearful, some grim, some blank-faced as they stared up into the deadly skies. Albert was helping Macaulay direct a stream of water when a woman tugged at his elbow. She pointed to the next house along. The flames were spreading there, smoke starting to drift out. As Albert let go of the hose, his colleague struggled to direct the spray. The woman grabbed the hose to help as Albert grabbed a torch, ran to the next door house, and kicked the door open. “Anyone in there?” he shouted through the smoke. He wasn’t sure whether he heard a voice or the creak of straining timbers. That was the sort of mistake that had cost a lot of good firemen their lives, and Albert knew he wasn’t even much of a fireman. Just a tailor with a badge and a determination to help. He couldn’t live with himself if it turned out that he’d left someone in there. Smoke rasped at his throat and made his eyes stream as he strode into the house, the beam of the torch showing the way. The noise had come from upstairs, so that was where he went. He could barely see the threadbare carpet through the smoke, and the heat was already pressing in, but he took the stairs two at a time until he was on the upper landing. There he froze. A bomb protruded from the ceiling above him, where it had got trapped on a beam. A small device, as incendiaries went, but more than enough to kill him and burn the house down. Through a bedroom door, a boy of twelve years or so sat in his bed, staring in terror at the bomb. “What if it goes off?” the boy shouted. Albert could almost have sworn. What was he meant to say? Of course the bomb might go off. With the house straining as its neighbour collapsed, their movements might be the thing that caused the bomb to drop. But if they didn’t get out now, they’d be burned alive. He pulled back a blanket, revealing the stumps of his legs. This wasn’t his first bomb. There was a crash as a section of ceiling gave way, flaming timbers falling onto the landing, fire threatening to catch on the stairs. The bomb shifted and for a moment Albert thought it was all over, but it didn’t fall yet. Summoning all the courage he had, he leapt through the flames on the landing. He’d never thought of himself as strong, but he swept the lad up in a single motion. “Hold on tight,” he said. Sweat poured down him and the boy’s fingers dug into his back. He couldn’t jump with this weight, so instead he laid the blanket across the boy for protection, turned, and strode through the flames. His legs blazed with pain and his exposed fingers felt like they might burst. The smoke was so dense he could barely breath. His head spun as he staggered down the stairs, desperate not to let the boy go. Albert let momentum take over, almost falling down the stairs in his rush to get out. Then he was on the flat and running, slamming against a door frame before he stumbled into the street. Someone took the boy. Someone else – he couldn’t see who, his eyes were streaming so badly – pushed him down on the pavement and beat at him with a blanket, putting out flames. Behind him, there was a roar as the bomb went off. At last, he got back to his feet. He tried to walk back to the hoses, but Macaulay stopped him, pointing instead toward an ambulance. “There’ll be more fires,” Albert protested, trying to ignore his pain. I’ve been reading a lot about the Second World War lately for my work at War History Online. It’s been a powerful reminder of the fact that civilians are always affected by war. 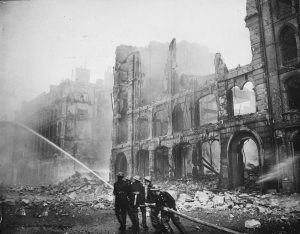 Several British firefighters won medals for their lifesaving service during the Blitz. Many more died. Their courage and hard work are worth remembering, especially as many were not professionals but had volunteered to help. If you’d like more historical fiction, check out my collection From a Foreign Shore. And if you enjoyed this story then please share it.